I mean really, right now just thinking about it gets me pumped all over again! Those of you from the DMV or if your one of my followers on Instagram @ThePrettyGirlsGuide I'm sure you already know the amazingness that I'm talking about because I pretty much flooded my timeline for two days straight with all things Ubiquitous and you guys know I NEVER flood timelines soooooo clearly I was impressed. This years Ubiquitous Hair & Health Trade Show (unbelievably) was actually the first one ever held! Just walking into the event you would have never thought that though. It was AMAZINGLY organized from ticket sales to sign in tables and vendor space to workshop area even security and volunteers. Everyone was on their A game, all of the event volunteers were VERY helpful and knowledgeable about what was going on where in the show and could direct you to where you wanted to be and if you had any other questions...just check out your handy dandy program and things were lined up and laid out for you like your clothes on the first day of school! As an attendee it felt as if the show went on without one hiccup and if there was one you would never be the wiser. The show was overflowing with some of the biggest names in natural hair care such as Shea Moisture, Jane Carter and ORS and the the African American beauty industry, Milani and Ambi and more! The workshops and panels were hosted by some amazingly talented bloggers who I'm sure some of you know and love like Afrobella and Naptural Nicole, hairstylist, business women and Dr's. Speaking of Naptural Nicole =) Here we are being total geeks with our blogger passes when we ran into each other on day 1!! Oh and of course the show was filled with curly, upon curly upon curly! I mean there were so many different types of textures lengths and styles, it was almost hard to even focus on what was even going on at the show. Every time I turned around I saw beautiful natural hair or a style that I wanted to try. There were even ladies getting styled as I walked through the show!!! Thats right live styling on site! All you had to do was walk up to one of the booths and you could be transformed from blah to TADA!! And it didn't even matter if you were natural, relaxed or transitioning. Between ORS, Design Essentials and Luster they had everyone covered! I feel like all of the DMV had to have heard about this show because...just the sheer amount of people that were there was almost overwhelming men women young and old everywhere you went there were tons of people. The hallways were filled with excited chatter about the next workshop, what new products they just scored at an amazing discount or the upcoming performances. All of the attendees were so happy! I loved it! Ladies getting their shop on! Day one of the show for me was pretty relaxed. I really got to walk around and take everything in, I got a chance to sit in on a few workshops & panels. One being the Design Essentials "Curls & Conversation meets straight talk" featuring my buddy and fellow Baltimore blogger NapturalNicole where things go oh so real! I mean things got serious!! The topic of relaxed vs natural and how women choose to care for their hair came up and lets just say people have some pretty strong opinions and they definitely stand behind them. But I loved it because thats how honest conversation comes about, my opinion on the matter? Relaxed or natural do you! At the end of the day its just hair and as long as yours is healthy and your happy thats no ones business but your own honey! Theres a lot of separation in the natural hair community when their shouldn't be we should be focusing on uplifting not tearing down. Anywho, while of course while I was there my main focus was product!! I have to admit I'm a bit of a product junkie, every time something new comes out if it seems reasonable I pretty much run to grab it off the shelf so having that many brands that I LOVE in one room had me on full on junkie mode!! I was all over the place looking to see what was new from each brand and also checking to see if there were just things that I had never seen in my stores before. Because let me tell you Baltimore is FAMOUS for not having product that everyone else seems too lol. By far Shea Moisture had the largest selection of products at the Ubiquitous Hair Show which I was super excited about! I had been itching to try their hair color system since it came out but was never able to come across all the colors at one store. Can we say color change come fall?! I also got to smell and check out a few more lines I had never seen. ORS and Ambi were also killing me with all the product choices!!! After being burnt out from all the workshops product junkie overload I had not even realized that it was almost time for saturdays main event!!! I literally think I was picking up a bottle at one of the booths and heard her voice over the speaker and was like 0_0. Not two seconds later did I take off running but of course the crowd had already formed. I stood and swayed as she sang and even belted out a few lyrics myself (you don't want to hear that ever). She was AMAZING such a voice and such a stage presence she had everyone in awe. Not to long after the performance I received a text saying it was time for my interview with Chrisette 0_0. But I was so not ready for Chrisette, however the show must go on! I DIED!!! I DIED!! I DIED! Chrisette Michele.....knew who I was!!!! She then admitted to being a heavy youtube junkie, she said she often just curls up in bed with her laptop and watches videos all night and that she remembers me from my Myregularasslife videos and said "oh yea your all over the internet"
After being completely caught off guard and going completely blank about what I wanted to ask her, I somehow regained my composure and we chatted briefly about her personal style, the Ubiquitous hair show and the empowerment of women. I must say that that was definitely the highlight of my day. I all but melted to the ground once I walked out of the door, but that was only day one...day two was still to come!!! 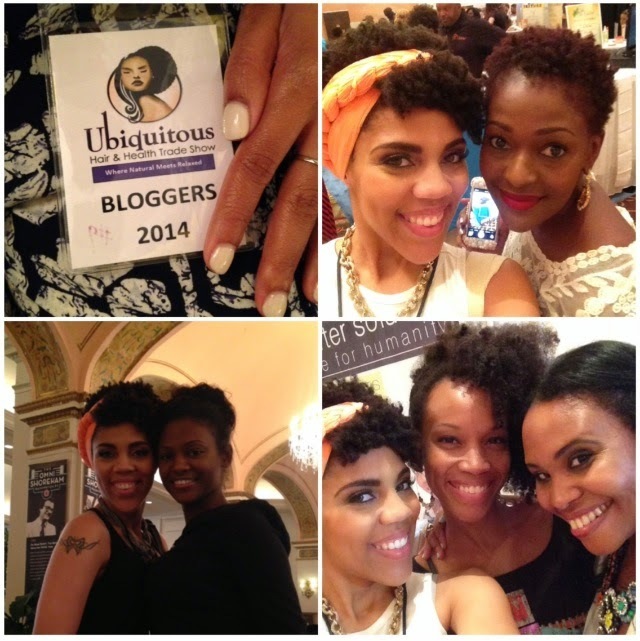 Were you at the Ubiquitous Hair & Health Trade Show? Let me know what you thought below! !